Cut three pieces of beading wire 24cm long. Lay them side by side, thread on a calotte and a crimp. Using flat or round nose pliers crush the crimp firmly. Close the calotte around the crimp. Use round nose pliers to curl the calotte’s hook into a loop. Separate the strands into a single and a pair. Thread a bead onto a single strand and another onto the pair about 2 inches from the calotte. Add a crimp bead after the bead that has two strands coming from it and using your crimping pliers to squash and round the bead. Now split the pair of strands and bring the single strand together with the nearest strand from the pair. Now add a bead to the new pair and another bead onto the single strand. Continue weaving the central strand back and forth adding as many beads as desired. 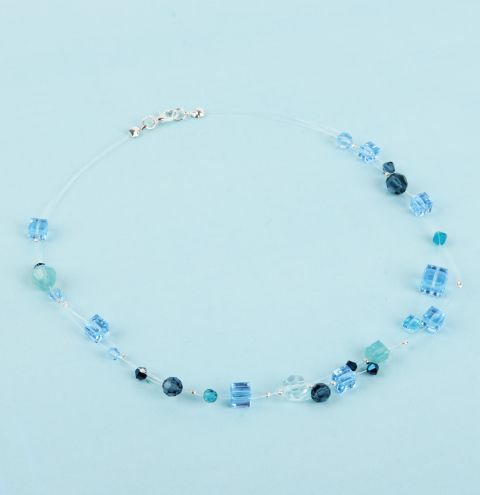 You might like to add a few crimp beads after the bigger beads to spread them evenly throughout the design. Finish by bringing all three strands together. Leaving a 2-inch gap of no beads, thread on a calotte and a crimp. Check and squash the crimp in the correct position. Close the calotte over the crimp bead. Attach a jumpring and a lobster clasp to one side and a jumpring to the other calotte.